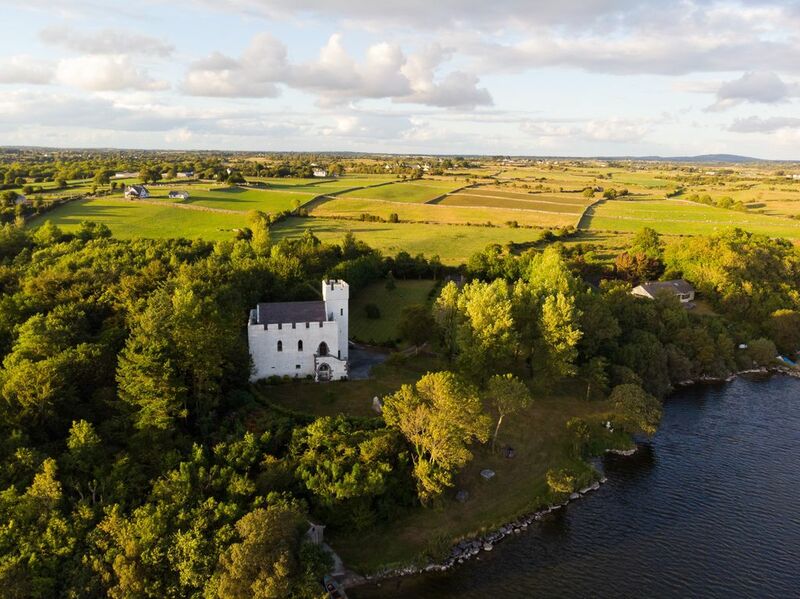 Surrounded by seven acres of lawns, park and woodland, Carraigin Castle is an idyllic holiday home in a beautiful setting on the shores of Lough Corrib, one of Ireland’s biggest lakes, famous for its brown trout and its multitude of picturesque islands. From the Castle one can enjoy boating and fishing on the lake, walking, riding and sightseeing all over Galway and Mayo, or just relax by the open hearth and contemplate the charm and simple grandeur of this ancient dwelling, a rare and beautiful example of a fortified, medieval “hall house”. Family groups or close friends will love the relaxed atmosphere of this authentic 13th-century manor house, which has been restored by the present owner after languishing for more than two centuries as a crumbling, roofless ruin. Carraigin's church-like structure sits on a rise reached by an avenue across the tree-lined Pleasure Ground. The ancient-looking, nail-studded front door on the ground floor, often mistaken for an authentic antiquity, was actually made by the owner during the building's restoration in the 1970s. Round the corner, an imposing stone staircase leads to another grand entrance, into the lofty, oak-beamed Great Hall featuring a wide, stone-arched fireplace that provides a comforting aroma of turf and wood-smoke. When Christopher bought the site of Carraigin Castle, his friends and family panicked at the idea of his attempting to restore what looked like a shapeless heap of stones. Even the builder who undertook to have a go at putting the place together thought he was 'cracked'. Chris had grown up near a ruined castle, and it had been his childhood dream to restore one. He was, therefore, quite determined to go ahead with the project. By doing a lot of research into medieval hall houses and visiting nearly every castle in Ireland, Chris lovingly designed every corner and corbel of the building, including the roof and the original door latches. I am particularly fond of the down-stairs front door. It took Christopher 7 years (!) to design it and collect the materials – hand-forged nails, oak planks etc. Finally he took one whole month off to build it, and although I am his wife and I say so myself, the result is quite delightful. In spite of its authentic medieval appearance, Carraigin is as warm and comfortable as any modern holiday home. Chris had grown up near a ruined castle on the other side of the lake. After a long search all across the West of Ireland he found (and fell) for the ruin. We come for the fishing, fabulous walks, fireside chats and peace and quiet aplenty. There's a boat to rent, with outboard, life jackets, fishing rods and an introduction to Lough Corrib by a local fisherman. Mobile available; can be topped-up. What a fantastic holiday we’ve just had at Carraigin Castle!!! An incredibly relaxing time in a beautiful, memorable setting. The castle is absolutely amazing. Beautifully restored with tons of really interesting features. The weather was pretty wet and windy most of the time, but that just gave us the perfect excuse to have a huge fire every day in the great room (main living room) - we spent most evenings reading and playing games around the fire, which was great fun. The kitchen was small but perfectly well equipped and there were loads of options as far as bedrooms were concerned (our kids loved the gallery room!). Just one more thing - everyone was so incredibly helpful - Anne gave us great information before and after booking and was really quick to respond to every question. Geraldine (who lives nearby) was lovely (really friendly and had great suggestions for things to do) and Dave (the boatman) gave us a great overview and instructions for using the boat (which we were able to take out a couple of times when the wind and rain stopped!). Thank you for a brilliant, relaxing holiday! Charm and grandeur of a 13th century castle with the modern conveniences of the 21st century. We recently stayed here for an entire week and it was one of the best decisions we made ahead of our honeymoon in Ireland. Location, location, location! The Castle feels totally secluded on its 7 acres, accessed by small meandering roads cutting through green hills with picturesque stone walls, it's the Ireland you have always imagined. Secluded as it feels it is only a 15 minute drive to a small but bustling town with a large grocery store (perfect for picking up any and everything you need for your stay), post office, and quiet Irish pubs. The location is also ideal for making day trips to places like The Cliffs of Moher, Eyre Square or countless ruins and castles. The views every morning from the back of the castle or the towers and spires rising above it were breathtaking and peaceful. We had fires every night in the big fireplace and read on the couch, but hey there is also cable and WiFi if you're not looking to disconnect entirely! The castle also has modern heat, so don't let worries of castle draftiness scare you off. The small kitchenette located off of the great room saw plenty of use and had everything needed to prepare meals, make coffee and tea, and store left-overs from Tina! If you go, be sure to have Tina prepare a meal for the night of your arrival, the food is spectacular and you can use the left overs throughout the week in other meals! Two big bathrooms and countless bedrooms may have been more room than the two of us really needed, but the rates were so good compared to even small cottages why not live out the fantasy and stay in a real castle! This place is perfect for the adventuring couple or big families that want to take a group vacation. We are so grateful that Anne has opened this Castle up for so many others to enjoy with friends and family. Our only hope is that in another five years we can comeback with our entire family to share in the magical experience! I recently stayed here with my husband, daughter (1.5 yo), and another couple with their 2 kids (1.5 and 4). This property is a great find for a group. Plenty of space for sleeping quarters and hanging out as a group. The kids loved all the window seats. We sat by the cozy fire every night enjoying drinks and games after the kiddos went to bed. The views from every side were beautiful, especially the lake. We even saw an otter one morning. The owner Annemarie, was very easy to talk to and very accommodating with the children. She helped us with 2 cribs and even brought in a high chair. It made it so much easier for us to not have to lug that stuff overseas. We've been home for 2 weeks now and are still talking about how cool this place was. I really do hope to get back again during one of our future trips to Ireland. Our family stayed at the castle and had an awesome experience. Plenty of room for the 8 adults and 5 children, beds for all. It is really amazing to stay in 800 year castle with décor that includes lots of wood, large fireplace, wall hangings, knights, queens, etc. Large dining table could accommodate all 13 of us. We took advantage of the recommended caterer, Tina, and she made us an amazing meal with enough leftovers to last for a couple days. She was also a lot of fun to sit and chat with, a wonderful lady. We also utilized the boat and toured around the lake. David, the owner of the boat, gave us a nice tutorial on using the boat, took us out the first day and told us some great stories about the area. The castle is close to Galway, Cong, and other sites for quick day trips. I would also recommend the Joyce Country Sheep Farm, had a great tour and demonstration of border collies herding the sheep. The host was did a wonderful job and was very entertaining. In addition, the farm itself is in a beautiful valley. In all, I highly recommend staying at Carraigin Castle, it is a great place to vacation. Thank you for your kind words. It was a pleasure for everyone to have you as a guest! Wow, wow, wow! We had an amazing time! An incredible setting. My imagination had my expectations fairly lofty and it did not disappoint. We were royalty for the week. The housekeeper was extremely helpful and reachable yet we were left alone to enjoy. The lovely women down the road came and catered our vow renewal and it was amazing. We were able go to many of the sites we wanted to see easily from the location. We are already hoping that one day we can have the fantasy Christmas at this splendid castle. You are in for a rare treat! I cannot say enough about our experience, a memory that will be cherished. I found Carraigin Castle on VRBO several years ago and added to my 'bucket list' immediately. My wife and I visited Ireland in 2009 and we made a pact that we would return. So, we finally planned a trip with my brother-in-law and his wife to stay a week in Carraigin Castle. I read all the reviews here and there is no hyperbole; the castle and grounds are a dream come true. It's beautiful, beautiful, beautiful. The castle had already captured my imagination, but actually being there we all went around as if we were in a dream. We were met by Marian the overseer and she was warm and charming showed us how everything worked and dropped by a couple of days later to see if we needed anything. We had arranged with Tina the gourmet cook catering lady, who lives about a half mile away, in the prettiest cottage in Ireland. We just told Tina that we wanted dinner after traveling almost 20 hours to get there in planes, buses and cars. She told us she would have a nice Irish supper waiting for us and she did not disappoint. She prepared an Irish feast of chicken, lamb roast, potatoes (5 different ways), cheesy baked cauliflower, cabbage and turnips, sausage stuffing, Irish soda bread, scones, 2 other loaves of bread, after dinner cheeses, fruit and to top it off a wonderful apple tart with home made vanilla custard sauce. We ate leftovers all week and still couldn't eat it all. The grounds are beautifully kept and the views are 360 degrees of picture perfect. The location is perfect; only 4 miles from the village of Headford where you can get anything you need at Joyces Grocery (a big modern supermarket with a great Deli). We took roads trips during the week to Cong (where 'The Quiet Man' was filmed) a drive through the Connemara mountains (very scenic) to Leenaun, Kylemore Abbey and Clifden. We drove to the the Cliffs of Moher (spectacular) and of course to Galway. Anne the owner recommended a restaurant in Galway, 'O'Grady's on the Pier', I give it 5 stars and the setting is terrific. You will make a wonderful memory if you stay here, we sure did.